Olympic rower Hamish Bond took time out from his hectic training schedule this week to attend his Massey University graduation ceremony. He was capped with his Bachelor of Business Studies on Wednesday afternoon, after eight years of part-time, extramural study. Mr Bond is currently in training camp with the New Zealand rowing team in Cambridge, but says Rowing New Zealand was very supportive of athletes pursuing their education. “Graduations or a close relative’s funeral – they’re about the only things you can weasel your way out of training for,” he jokes. With Olympic preparations an all-consuming activity, it was a relief for Mr Bond to complete his final paper during summer school and to concentrate fully on rowing. But taking the afternoon off to attend his graduation ceremony was a welcome break. Mr Bond is also grateful for the flexibility offered by Massey University’s distance learning programme, and says it was the only way he could make study and training work. “I started off at Otago but when I made the New Zealand rowing team I had to relocate to Cambridge. I could have gone to Waikato, I guess, but it would have been too hard to train and try to fit lectures around it. When you are in a crew boat with other people, it’s not like you can train when you’ve got free time. You have to be there at a specific time and lectures get thrown out of the window. While rowing is Mr Bond’s sole focus for the immediate future, he says he is also looking towards his post-rowing life. “I’m not sure what I want to do yet really, but I have a degree in finance so it will be something in that area to start off with. One of the good things about rowing is that I have made some relatively influential contacts and connections that may help to open doors in the future,” he says. 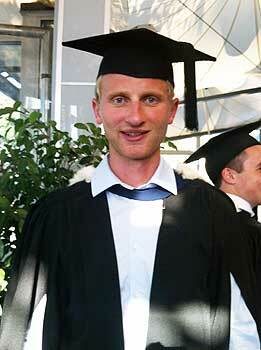 Bond was one of more than 1000 students to graduate during Massey University’s six Albany campus ceremonies. Graduation ceremonies will take place in Palmerston North and Wellington in May.